Juno Reactor have released the first track, “Guillotine (BLiSS Remix)”, off of their upcoming “The Golden Sun… Remixed”. The remix album is the companion to the 2013 psytrance album “The Golden Sun of the Great East” and also includes remixes from Extrawelt, GMS, Ritmo, Zeologic, Cylon, Modus, Tortured Brain, and Jitter. 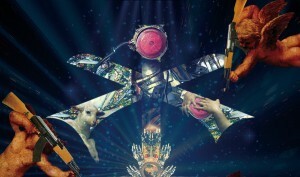 Preorder Juno Reactor’s “The Golden Sun… Remixed” right here.